That is today's question? And for more FUN... visit other Metamorphosis Monday posts over at Susan's Between Naps on the Porch... and other BLUE posts via Smiling Sal's! I vote for all the lovlies in the background and underfoot. :-) I love wrought iron fences, flooring, foliage and flowers. Merry Christmas! Hello Fifi, your note cards arrived on Saturday. We were gone for the weekend but it was a thrill to see them on Sunday when we arrived home. I am posting them on Blue Monday. Come over. I like the first photo. I admire the background and table. I love the wrought iron background fence especially. Thank you so much for the lovely note cards. Fifi, have a very happy Christmas and a wonderful New Year, xv. G'morning, Fifi..I love all the things in the background...just beautiful. I framed the beautiful painting you did of the Luncheon in the Vineyard and am giving it as a Christmas gift to my son and daughter in law. I know they are going to love having a painting of their vineyard....Thanks again! I would definitely choose the one with background! My Blue Monday, Merry Christmas! Blue Monday with our new eye candy, happy holidays! Oh that painting looks beautiful you are really talented. Happy blue Monday. Morning, Fifi. If we're voting, I'd choose the first picture. I almost always prefer details. Happy Blue Monday and Merry Christmas! I love both of them, but when I looked at the second one, I thought how nice it would be to have FiFi do a painting of one of the vintage rattan chairs on my porch. They remind me of the ones we had in our home when I was growing up and they always put a smile on my face when I walk outside. How lovely it would be to have one of them inside, hanging on my wall! Hmmmm…have to see if the New Year brings more work. 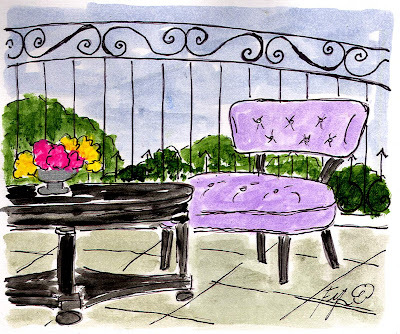 But wouldn't it be special for someone to commission a painting of their dad's favorite chair or mom's dressing table? Oh, the possibilities are endless! lovely chair, Fifi! hope you have a wonderful week! And your Tweet for your twitter looks just like our little Tweety! Wow that is so great...I am thinking that is a very good header. I love them both that chair should be MINE....but I think I would choose the first pic.. Came by to wish you a wonderful Merry CHristmas to you and your family! Oh you're doing chairs too. They ARE fun to paint arent they. Lovely paintings as usual. You should try canvas again soon. You do chairs so well...love it! Merry Christmas sweet Friend to you and ALL of your men. Beautiful chair, Fifi! What woman wouldn't want something just like it in her budoir! I'm afraid that I can't choose, Fifi. They are both lovely. Which do you think Petunia would choose ? I respect her judgement and impeccable taste. Whichever one , it would look lovely in any home. 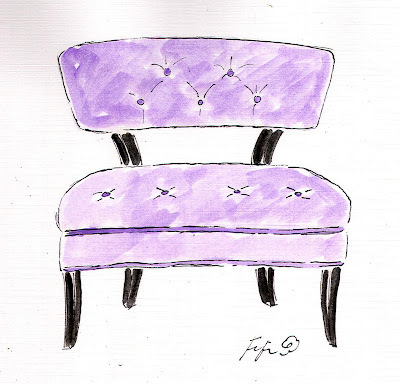 I will be getting my Fifi chair painting framed after Christmas . What an amazing veranda that is! Love that chair! Your painting is so beautiful, colorful and restful. Oh I do love your paintings! Thanks for the visit and Merry Christmas to you! They are both charming and lovely, but if pressed into choosing one over the other for hanging, it would have to be the one without the background. I can just picture it framed and hanging. It would make a nice statement.